We’ve been advertising! If you’re new, we love you and hope you stick around! I think this page might win “Most Speech Bubbles in a The Fourth Page Ever.” Congrats, Victor. Also, this team I call “the knock-offs.” They’ve shown up before (or technically, later) in worse circumstances. I think we settled on calling the ginger Ron and the others Harry and Hermione although I can’t for the life of me remember where. I love Team Knock-Off. Their Flish is super pretty. Snaggles is great! I’ll to take a picture soon. That last panel! Best thing. This stage of her career; dead for years? In general I would agree with purple flish, most people WOULD naturally be non-useful in their chosen field at that point. Is it proper to capitalize the names of the races every time? Demon, demon, Flish, flish, ghost, Ghost, Zombie, Floyd, etc. Does Castle Skærva have vacation days? How nice of them, they loaded the wagon for Ecta and team! Floyd? Lurkin is the only one you need to capitalize every time. It’s just a cultural leftover, not that they think they’re superior. Oh, Floyd, you should know that being eccentric makes you stand out and not able to sneak out like that. grow up floyd , your gonna be needed soon. Well it’s been a long journey but I just finished reading through the archives. You’ve got a new reader on your hands. So are all the ghosts team leads? 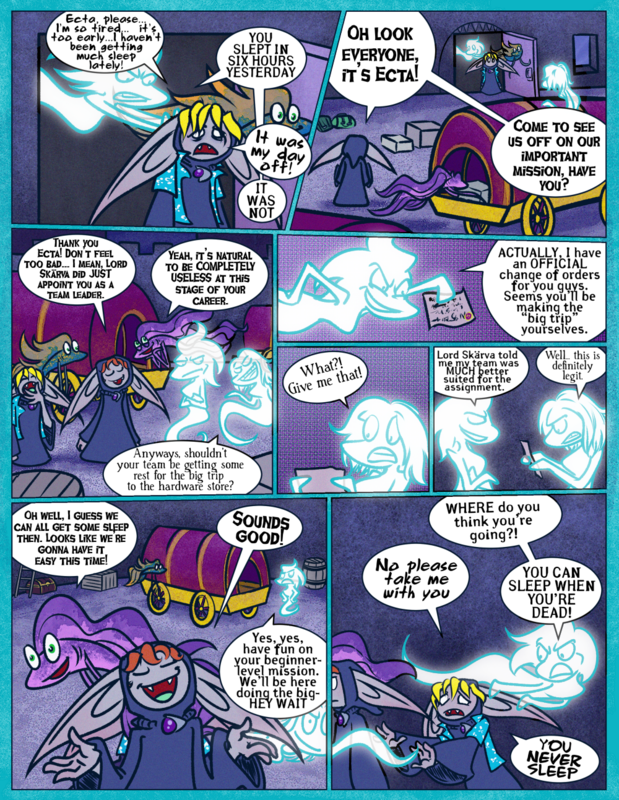 It would seem like there is a pecking order amongst the minions; with Flish being the weakest, then Lurkins being a step up, and then the ghosts being ‘elites’ of some sort? Not necessarily. It makes the most sense for ghosts to be in charge because usually, they’ve been working for the Skärvas the longest. But really it’s just who shows the most initiative and natural leadership… and who’s able to keep peace and get a team to work together, which is why it took Ecta so long. Poor Floyd looks like a zombie!